This view is a graphical representation of the network topology as interpreted by the current capture data. Each time a new node and address is detected on an incoming packet, such node is included into the representation. The Graphic View is composed of a canvas and a toolbar (see the figure below). The canvas contains a network graph showing the current network nodes. The toolbar offers access to options such as adding a background, customizing the network graph layout, selecting what data is shown, and controlling the zoom. This chapter details each of those options. To change the background of the canvas, click on the Load Background Image toolbar button (see the figure below). The Open dialog will appear. Select the new background image and click the Open button. You can use images in the .bmp, .gif, .jpg, or .png file formats. After adding a background to the canvas a Background Tool button appears in the top right section of the canvas area, this tool allows the user to move, zoom and change the transparency of the background image. This tool button can be hidden after use by clicking on the Hide button in the control or in the Show Tool menu item in the Background Tool button in the Graphic View Toolbar. If the Background tool is not visible, you can show it again by clicking the Background button in the Toolbar and selecting the Show Tool Option. 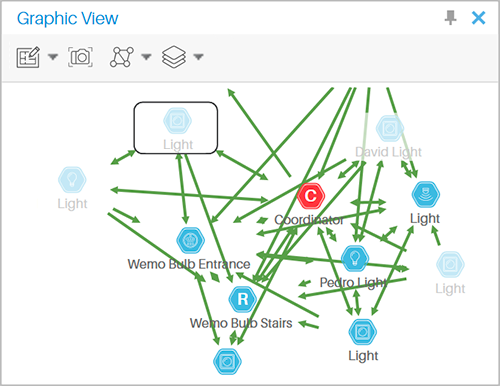 Ubiqua has 4 different default node statuses icons for Zigbee networks, represented with colored hexagons in 4 different tones. A blue icon represents a router node, a green one represents an end device, a red icon represents a coordinator node and a gray one represents any other case. For Thread networks, every node state is represented with the initials of every node’s role and type. The L letter represents a Leader node, the R letter represents a Router node, the End Devices are represented with an E letter, the BR acronym represents a Border Router, and the LBR acronym is for a Leader Border Router. The appearance, position and alias of the nodes can be customized by you. You can change the position of the nodes by clicking and dragging each one within the Graphic View. The connecting arrows will move as the node does for persistence. Also, note that for this action is recommended that the Graphic and the Network Explorer Views are not hidden or auto-hidden. If you want to easily identify the nodes of your network, Ubiqua allows you to visually customize them by letting you change their alias and their icon. To do so, right click on one of your Graphic View’s nodes and select the ‘Customize’ option in the context menu to open this window. The node’s ‘IEEE Address’ and ‘Alias’ will be displayed in it, being the second one only available for you to modify it. The ‘Customize’ window can also be opened from the ‘Properties’ view, clicking the ‘Customize’ button located in the ‘Customizable Properties’ expander below the ‘Alias’ input, as well as from the ‘Options’ window, under the ‘Network’ > ‘Devices’ tabs, a list of devices is displayed where each of them can be identified by their ‘IEEE Address’. Right clicking on them and selecting ‘Customize’ option will also open that window, unlike the window opened from the 'Graphic View', the window opened from the device list displays the ‘Short Address’ of the selected device. 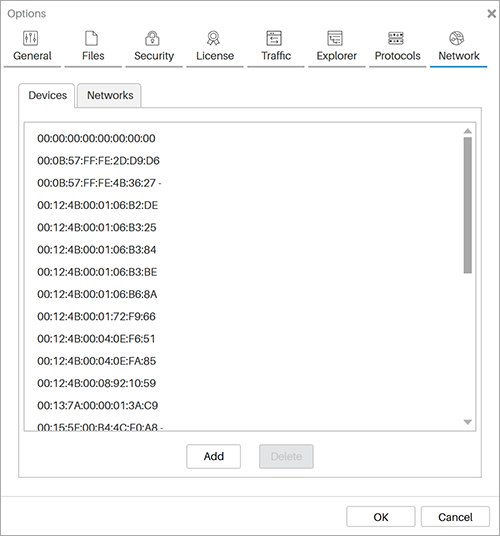 Note that if the device has previously appeared in the network with different short addresses, they will be displayed in a list under the ‘Existing Short Addresses’ expander. The ‘Customize’ window also has the function to let you change the node’s icon. In the left side of the window you will see a circle with the legend ‘Change Icon’, click on it to open the ‘Set Node Image’ dialog, which is compound of 2 columns, the left one lists the different categories of the ‘Ubiqua Icon Set’ for your devices, the right one shows the correspondent icons of the selected category. To assign an icon to your node, click on one of the listed icons and then click on the ‘Set Icon’ button at the bottom right of the dialog, following this action the icon will be set and previewed in the ‘Customize’ window. If you prefer to add your personal image files to the network nodes, click on the ‘Custom’ option at the bottom of the ‘Categories’ column, after this a drag and drop area will be displayed for you to place your images, below this a button with the ‘Choose an image’ legend will also appear as an alternative option to open a file locator in your computer to load your images. The chosen images with the ‘Custom’ option will also be previewed in the ‘Customize’ dialog. Once you have performed the previously mentioned steps, click the ‘Save Changes’ button to visualize the node customization, or ‘Cancel’ to keep the node’s default properties. 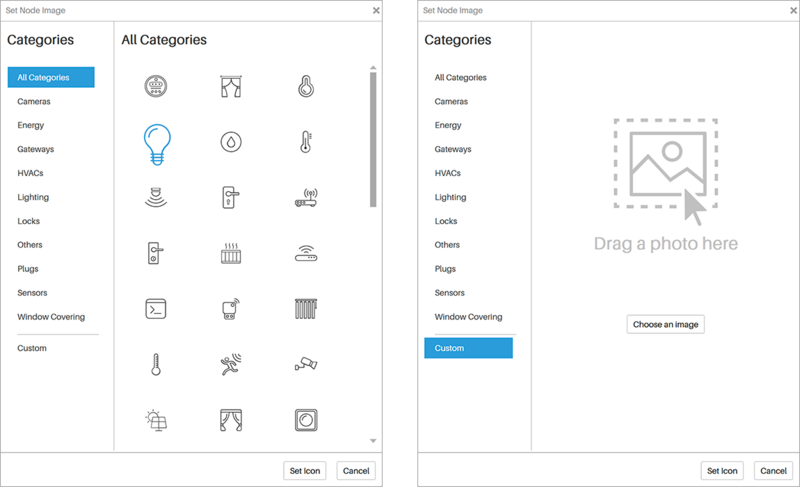 If you saved the changes the Graphic View will be updated with your new given Alias and Icon properties. When you modify a node alias or icon, this is saved in your configuration, this will help to remember your choice, and when the node appears again in the capture it will use the previously saved data. By the time you have nodes aliases saved in your local configuration, when you open an external .cubx file, the local and external data has aliases you will be asked in a dialog if you want to update your local nodes aliases, if you press the Yes button those nodes that appear repeated in your local saved configuration as well as in the external .cubx file, will be renamed as they appear in the external file (this is everytime a .cubx file is opened), those nodes that do not appear in the opened file will keep their local given alias. If you want yo change this configuration you can go to the Tools > Options > Files, uncheck the “Update saved aliases when uploading files” option and press the OK button. Right clicking on your nodes also gives you the possibility to filter your Traffic View capture, select the ‘Create New Filter’ menu item, and a customized filter option for your selected node will appear for you to click it, following this action the Traffic View will only display those packets related with the selected node in the Traffic View. Ubiqua shows two kind of relationships between network nodes: Topology and Routing. Each one of these are represented in the Graphic view as layers. The Topology layer for Zigbee captures is constructed by examining the information of the MAC 2003 and 2006 association request/response message and are represented by blue color edges. The Routing layer for Zigbee captures is constructed by examining the information contain in the Zigbee Network Link Status messages and are represented by green color edges. To span the Graphic View, click on any free space on the canvas and drag the mouse cursor. For zooming use the Overview map control or use the mouse wheel button. The Graphic View has a feature useful to share the visual representation of the network. You can export the contents of the view as an image. To do so, click on the Save Image toolbar button. The Save dialog will appear, select the location and the file format and click the Save button. You can save images in the .bmp, .gif, .jpg, .png, or .tif file formats. 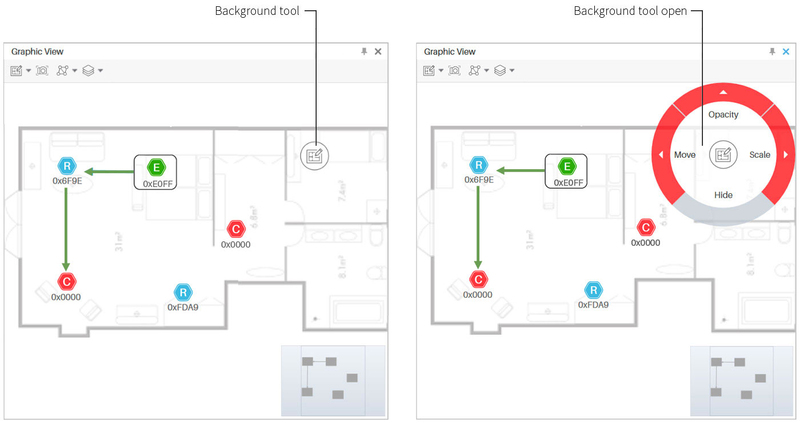 The Graphic View has the ability to hide and show nodes based on their PAN id or corresponding communication channel. To do this select the "Network Nodes" option from the "Layers" toolbar in the Graphic view, and select the way you want to Show/Hide the nodes, either by channel or Pan ID; next a list of the selected items will appear. To show an item just click to show a check mark, to hide it click the item for uncheck. The 'Graphic View' is the visual representation of the nodes that are part of the network, Ubiqua also allows you to see those nodes that have joined and then leaved the network during a current capture, this nodes are visualized in the topology with a clearer opacity than those nodes that are currently connected to the network, the incidence to the nodes to which they were connected will also be displayed. If a node connects multiple times to the network, will also be reflected in the topology, drawing each one of the times that this node joined the network during the capture in the 'Graphic View’. 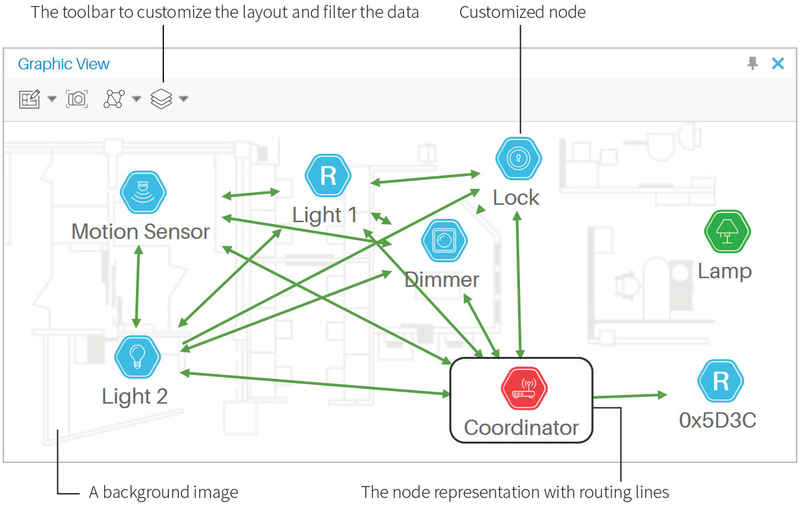 To be able to see this behavior click the ‘Layers’ button in the toolbar of the ‘Graphic View’, then uncheck the ‘Hide ghost nodes’ option in the context menu, if you want those nodes not visible, keep the ‘Hide ghost nodes’ option checked.